SHANNON, Ireland (CNN) -- U.S. Secretary of State Condoleezza Rice said she has seen nothing to indicate that Iran is prepared to suspend uranium enrichment. Her comments came Monday during a re-fueling stop in Shannon, Ireland, en route to the Middle East. On Saturday, President Mahmoud Ahmadinejad said Iran will not give up its right to nuclear technology, Iran's Islamic Republic News Agency reported. "Iran's enemies, who are against the progress and development of the Iranian nation, oppose our access to nuclear energy on the pretext of development of nuclear weapons by Iran," he said, according to IRNA. "They cannot witness the advancement of Iranian youth in science and technology. Therefore, under the excuse of Iran's possible deviation from nuclear path, they deny Iran's nuclear right." The U.N. Security Council demanded that Iran suspend all uranium enrichment by August 31 or face the possibility of economic sanctions. Iran missed the deadline but said it would consider temporarily suspending its program as a condition for talks with the United States. European Union foreign policy chief Javier Solana met with Iran's chief nuclear negotiator Ali Larijani last week, but there was no breakthrough and no commitment for Iran to suspend its uranium enrichment program. In June the United States, Britain, China, Russia, Germany and France offered Tehran a package of trade and political incentives, including face-to-face talks with the United States, if it scaled back its enrichment activities and focused on a civil nuclear program. Under Resolution 1696, Iran must end its nuclear activities or face the possibility of economic sanctions, although China and Russia -- both veto-wielding members of the Security Council -- have been reluctant to sanction Iran or agree on what sanctions should be put in place. On her trip to the Middle East, Rice is scheduled to travel to Saudi Arabia, Egypt, Israel and the Palestinian Territories. The stated purpose of the trip is for Rice to lead a "diplomatic effort to engage moderate leaders across the region," according to the State Department Web site. In Saudi Arabia, Rice will meet with Saudi King Abdullah. In Cairo, she will meet with President Hosni Mubarak and Foreign Minister Aboul Gheit. Later in the trip, she will meet with Palestinian Authority President Mahmoud Abbas and with Israeli Prime Minister Ehud Olmert and Foreign Minister Tzipi Livni. 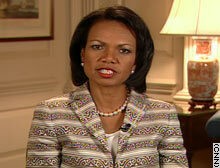 U.S. Secretary of State Condoleezza Rice is due to meet moderate leaders across the Middle East on her trip.